New US stance on two-state Mideast solution - refreshing or regressive? While Donald Trump’s reluctance to move the US embassy to Jerusalem is not surprising, his approach to untangling the Israeli-Palestinian conflict might be refreshing even without a concrete action plan, politicians and experts told RT. US President Donald Trump and Israeli Prime Minister Benjamin Netanyahu on Wednesday had their first face-to-face meeting since Trump came into office. The American leader discarded the previous commitment of the US to a two-state Israel-Palestine solution. However, Trump called Netanyahu to restrain from settlement expansion in the Occupied Palestinian Territory. 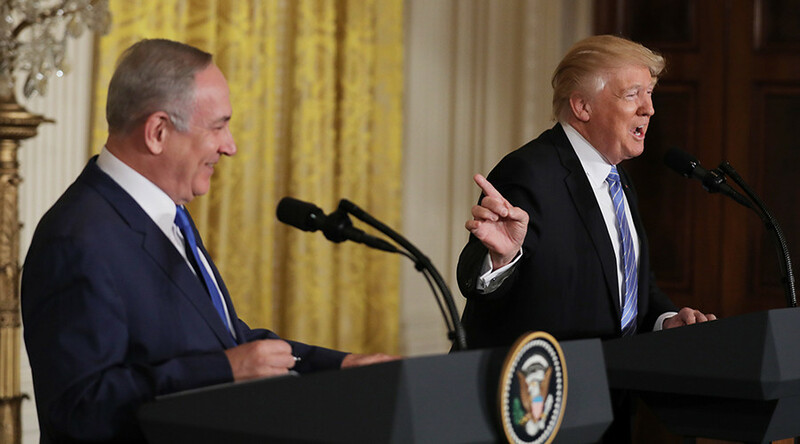 Speaking at a joint news conference, he said the US “will encourage a peace and really a great peace deal” between the two Middle Eastern states. The US President said he is “looking at two-states and one-state,” and likes “the one both parties like," adding that he "can live with either one." — RT America (@RT_America) 15 февраля 2017 г.
Trump’s statement that the US would no longer insist on an independent Palestinian state as part of a peace accord between Israel and the Palestinians contradicts both with Israeli PM’s Netanyahu views and decades-old American approach to the problem, Mustafa Barghouti, leader of the Palestinian National Initiative and a member of the Palestinian Legislative Council, told RT. “I know that Mr. Netanyahu has a different plan; the Israeli prime minister wants to establish a system of discrimination and racist apartheid against Palestinians as a substitute for the two-state solution,” Barghouti said. The Palestinian National Initiative, he said, has always demanded a one-state solution with equal “democratic rights for Jewish, Christian and Muslim Palestinians.” If that’s not the case, the new US approach to the problem might even regress the reconciliation process, Barghouti said. “Unfortunately… there was a statement from White House officials that they don’t think that the two-state solution is a must for achieving peace. And that is definitely a regression,” he added. “It’s very refreshing for people in the region to hear that the US government hasn’t made up its mind what the best solution is and that it’s really up to the parties – the Israelis and Palestinians – and by extension other countries in the region to really work it out and figure out what works best for them,” he told RT.